As FIM motocross history has it, Dylan Ferrandis, straight out of Avignon, France, came to the fore in global motocross in 2014 when he won the opening moto of the Motocross World Championship season at the klieg-lit Losail International Circuit in Qatar. He wound up fourth that year in the title fight. Putting an exclamation mark on the entire season was the fact that the young Kawasaki racer was a member of the victorious French Motocross of Nations team. In 2015, Ferrandis took his first career Grand Prix victory at Argentina, and by the conclusion of the 2016 season, Ferrandis was considered one of the best young racers in the world. But his heart was dead-set on America. We’re now in the twilight of his second season in U.S., and as a member of the Monster Energy/Yamalube/Star Racing Yamaha outfit. After a big crash ended his Monster Energy Supercross season early, it turned out to be a good season for Ferrandis, who posted up Lucas Oil Pro Motocross Championship overall victories at both Southwick and Unadilla. Now there is one last mission, and that is to help Team France grab its fifth consecutive Monster Energy Motocross of Nations victory at RedBud come a week’s time. With MXoN wins at Unadilla in 1987, Budds Creek in 2007, and Denver in 2010, Team USA has never been defeated on home turf, and Ferrandis, understandably, wants to put an end to all of that. On Thursday, we spoke with the French MX2 rider at his home in Southern California. Racer X: Dylan, how’s it going for you this second half of the week? Dylan Ferrandis: Real good. Today I am just relaxing. Yesterday I rode and today I did some training. Tomorrow I’ll ride Glen Helen and try to be ready for the Motocross des Nations. Are you excited? Are you ready to line up for Team France? Oh yeah. Of course. Definitely. Yeah, it’s an important race for me, and especially since I now live far from my country. To race for my country is very important. There has been a lot of talk centering upon the French team. Having won the last four iterations of the race going back to 2014, has it been a little surprising to have the drama swirling around the French team heading into RedBud? What happened is what happened, you know? I think the federation had their reasons for choosing who was in the team. I don’t really know the reasons, and I don’t want to know. They made the choice, and unfortunately [Romain] Febvre is now out, so they will have to find another rider. I understood how Marvin looked at it all. They didn’t select him, and after somebody else got an injury and they had to replace him, Marvin didn’t join the team. You can’t decide what to do at the last minute. We all have a big challenge and we all have had a long season, and when your season is finished, you don’t want to stop what you are doing to get ready for another race. I have nothing special to say because I don’t really know the reason. I just know that we are a strong team anyway. Jordi [Tixier, who will be replacing Febvre] is a good rider. He is not at the top of the championship this year, but I know on a particular weekend, he can make good starts and ride strong and he can do the job. We all know that at the des Nations, that anything can happen. I think if we all give it our best and don’t make big mistakes, that we can be a contender for the win. Yes, and the last time you raced for Team France at the Motocross of Nations was when you guys started your win streak at Kegums, Latvia, in 2014. Yeah, that’s true. It’s definitely great to be going back. And during the last four seasons the French team won. We are not under pressure, but we need to stay the best nation! Yeah, it’s all pretty exciting. You placed third overall at the Lucas Oil Pro Motocross Championship round at RedBud this July, and in 2017, your first season in the United States, you placed fifth overall in Michigan. Do you like the venue and the circuit? Yes, RedBud is a very good track. It is one of best on the circuit. I remember that last year for my first time at RedBud, I didn’t like the track because they were waiting for a lot of rain and it was dry and hard-pack, and I didn’t like it so much. This year, though, the track was amazing and I really enjoyed it. Yeah, we’ll see for the des Nations. I don’t know about the weather. Maybe we will have some rain. That could be something to be careful with because we all know that anything can happen in a race with the mud. Yeah, I enjoy the track. It’s going to be interesting. We can have a lot of rain, I think. After healing up from a broken arm, broken teeth, and an injured jaw you suffered at the Atlanta round of the Monster Energy Supercross Championship, you ultimately returned to action at the High Point National in Pennsylvania. And when you did make it back behind the starting gate, you were right there and running in the top three. In your opinion, a good outdoor season? Yeah, for sure. It was a good season. After my injuries, I took the time to be fully ready to be competitive, and yeah, it was a good choice to wait because as soon as I got back to the races, I was fighting for wins and podiums. 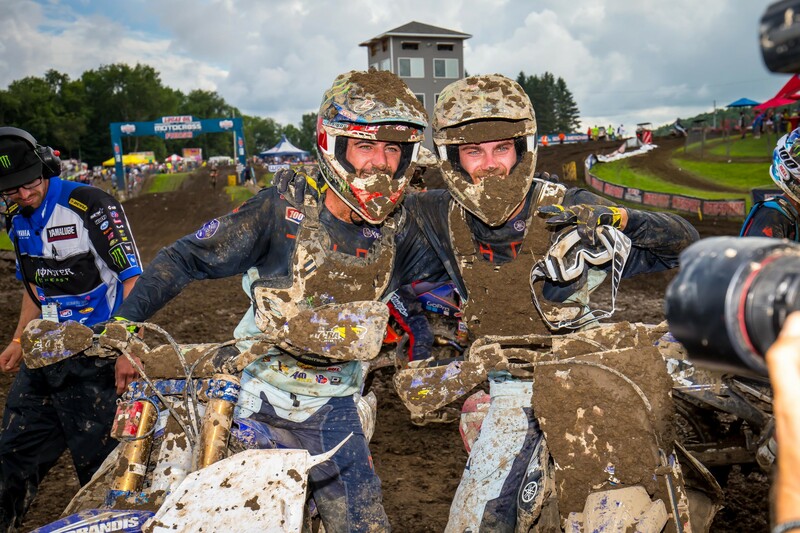 It was very good to grab my first overall and my second overall with a double-moto win at Unadilla. That was an amazing feeling, you know? It was a really good time and I really appreciated all the races I did in the championship. Afterwards, I took some holiday and took one week and I rode some supercross because the week after the des Nations, I will do a supercross in France in my hometown. I’m really excited about the race in Marseilles because I will race in front of all of my friends and family. Will you do additional races throughout the early winter months before getting ready for the 2019 supercross season? Yep, after the supercross of Marseilles, I will do the supercross of Paris. I recently read an interview where you spoke about the Motocross of Nations at RedBud, pointing out, “…I can say to Aaron [Plessinger] that the 250 rider is the most important on the team. We have to do the job—the guys on the 450s can start in front, start top three, top five, easy…. It’s going to be not easy for us riding against the 450s.” Can you talk about that? Yes, in theory, you and Aaron Plessinger could be fighting each other pretty fiercely at RedBud come next Sunday. Yeah, for sure. We had some good battle this year, but I think we are fair with one another and always try to ride fair against each other, and I think that is the most important thing. The competitive landscape will be an interesting one at RedBud, as not only will you be fighting against Plessinger, but also the 250cc Grand Prix riders such as Jorge Prado of Spain, Ben Watson of Great Britain, Calvin Vlaanderen of Holland, Hunter Lawrence of Australia, and Jago Geerts of Belgium. Have you sized those guys up at all? Definitely. For sure. I don’t really know where we are in comparison to the guys in the World Championship. I don’t know if we are much better or not. I think on Saturday during the 250 class race, I’ll be able to compare my speed with the riders from the GPs. I mean, my opinion is that the Yamaha bike that Aaron and I have are definitely the best 250 bikes in the world. I think we’re going to have some help with that, but we’ll see. Maybe the GP guys are much stronger than we think. The Motocross of Nations will turn 71 years old at RedBud. I wanted to ask you if you’re a fan of the event’s history and heritage. Yes, for sure. I was born in 1994, and before 2000 is difficult for me to remember because I was too young. However, from 2000 up until now, yeah, I think I know everything about the race and who won it. The Motocross of Nations is really a fun event and is something I would not want to miss. I can’t wait for RedBud.